The highlight of Steve Kennedy’s professional tennis career had to be playing a first-round match in the 1987 U.S. Open, his lone Grand Slam appearance. Thirty years later, Kennedy was once again competing in a U.S. Open. Only this time it was the second annual U.S. Open Pickleball Championships, and he was playing a fast-growing racket sport that’s sometimes referred to as table tennis on steroids. Kennedy, 51, a Fort Lauderdale native who has taught tennis in the Jimmy Evert Tennis Center at Holiday Park for the past 27 years, reached the finals of the 50-and-over senior singles pro division. 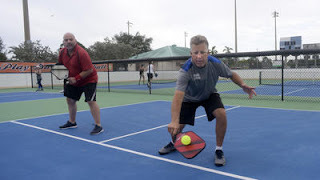 Like thousands of tennis-playing baby boomers, Kennedy has fallen in love with pickleball, a combination of tennis, racquetball, table tennis and badminton that is spreading across America. It’s especially popular in South Florida, where courts are sprouting in city parks, gated communities, retirement villages, YMCAs and suburban neighborhoods.